NASA astronaut and first-time spacewalker Jack Fischer caught this view of Earth and NASA astronaut Peggy Whitson, on her ninth spacewalk, during a mission outside the International Space Station May 12. "Biggest slice of awesome pie I've ever seen," Fischer said. Astronauts sped through the landmark 200th spacewalk at the International Space Station, after a glitch in preparations left them looking at a shortened trip outside. This marked the ninth spacewalk for space station commander Peggy Whitson and the first for flight engineer Jack Fischer. Whitson beat the record for the most time spent on spacewalks by a woman on her last excursion out of the station, in March. "Oh my gosh; this is beautiful," he said after getting his bearings outside the station. "Isn't it?" Whitson said with a laugh. "Biggest slice of awesome pie I've ever seen," Fischer said. "About a fondue pot — a ginormous fondue pot bubbling over with piping-hot awesomesauce," he replied. But it wasn't awesome from the beginning. The spacewalk suffered a delayed start when one of the service and cooling "umbilicals" that charge up the spacesuits before exit sprung a small water leak, so the two astronauts had to trade off use of the other umbilical for power, oxygen, communications and cooling as they prepared to leave the airlock. Because of the decreased battery charge on both spacesuits, the astronauts focused on their most important task first for an abbreviated spacewalk. The spacewalk officially began at 9:08 a.m. EDT (1308 GMT), one hour after the planned start time, and the duo went straight into the main task: to install a 200-lb. (90 kilograms) express carrier avionics box onto one of the four "spare parts depots" outside the spacecraft, where they replaced one that had been experiencing thermal issues. The astronauts spent 4 hours and 13 minutes on the spacewalk, and managed to blast through much more work than expected. 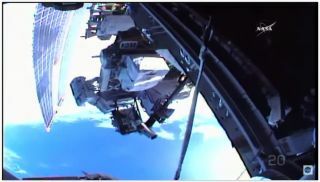 Fischer rode the station's Canadarm2 robotic arm, driven by French astronaut Thomas Pesquet from inside the station, to help maneuver the bulky spare box that Orbital ATK's Cygnus supply spacecraft delivered to the station last month. The avionics box will carry data connections and electricity to science experiments at the station. The duo got through the task so quickly that they were given the go-ahead to add back a few more. First, Whitson installed a connector on the $2 billion Alpha Magnetic Spectrometer to help engineers analyze the sensitive particle detector for future cooling-system repairs. Then, Fischer secured insulation that had come loose at the wrist of the Japanese laboratory module's robotic arm. NASA astronaut Jack Fischer worked outside the International Space Station May 12 on his first-ever spacewalk. Fischer was also able to install a protective shield and a foot restraint on PMA-3, an attachment that will help commercial craft dock with the station via a future International Docking Adaptor. It wasn't originally assigned as Fischer's task, so Whitson and NASA astronaut Kjell Lindgren, spacewalk communicator back on the ground, guided him through the steps. The spacewalkers "breezed through" and mananged to get to all of the major tasks originally planned for the spacewalk, despite the wrinkles at the beginning and limited time available, an announcement at Johnson Space Center in Houston said. The two remaining minor tasks, installing a high-definition camera and pair of wireless antennas, will be rescheduled for a later spacewalk. NASA astronaut Peggy Whitson, nearing the end of her ninth spacewalk, hung near the airlock on the International Space Station May 12. The first spacewalk in service of the space station, in December 1998, focused on attaching the orbiting lab's very first modules: the U.S. Unity module, which NASA crew brought into space on the space shuttle Endeavor, and the Russian Zarya module, which had already been launched into orbit. Since that time, space fliers from around the world have ventured out on spacewalk after spacewalk to build it into the complex network of living space and experiments it is today, hosting research and experimentation 250 miles (400 km) above the Earth. "This is amazing, to be able to do the 200th EVA [extra-vehicular activity] on board the space station," Whitson said as the spacewalk came to an end. "It's a huge honor to work with all of you." "Only because of legends like Peggy, and Jerry Ross and [Jim] Newman [who took that first station spacewalk] and the guys who started this, that made this possible," Fischer replied. "They created this amazing floating laboratory in the sky that we call home, and [did] one heck of a job. It's humbling to be a part of their legacy."